Need fast, affordable lawn care services in Wichita, Kansas? See why we're the #1 rated lawn care service in Wichita. Get an instant quote for lawn care services near you such as lawn aeration, lawn mowing, leaf removal, gutter cleaning, gardening, yard care, weed control and more. Lawn Love is bringing lawn care into the 21st century making it easier than ever before to get quality, top rated lawn care services at affordable prices. All of our lawn care services are backed by a 100% satisfaction guarantee. Sit back, relax, and let Lawn Love handle all your lawn care service needs. Most people imagine large expanses of farmland and cows when they think of Kansas – but you know better! 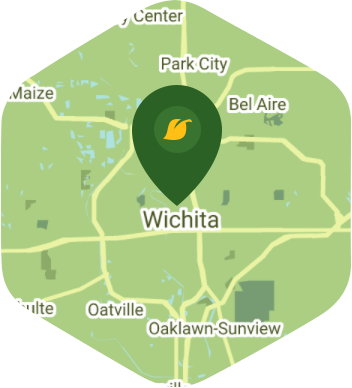 You know Wichita as a place that would surprise most people, with its entertainment, culture, trade, and media making it a fast-paced and vibrant city. When you have time to kick back, relax, and take a break the last thing on your mind is lawn care and maintenance. Why sacrifice your free time to your lawn when you can hire Lawn Love to take care of it for you? Lawn Love is a fully bonded and insured lawn care company. Our teams of skilled lawn care technicians want to use their expertise to help make your lawn a place you want to come home to. We can take care of all your lawn needs, from the weeding, seeding, and mowing to the aerating and clean up. There's no job too big or too small for the lawn care professionals at Lawn Love. To find out more about our services and to take advantage of our free, fast and easy two-minute quote, call Lawn Love today at 316-218-9454! Rated 4.85 / 5 stars in 53 Wichita customer reviews. Dusk and dawn are the best times to water your lawn (the sun will rise at 6:42 AM and set at 8:13 PM today in Wichita). Here are some average lawn care prices for homes in Wichita. Average lawn size 6,021 sq. ft.